Ask FM is a popular Q/A website where you can ask users questions anonymously and answer questions too. It was created in 2010, where it was commonly used by people in Ireland but slowly gained popularity around the world and it has stolen 1/10th users from famous social networking websites such as Twitter, Facebook, Snapchat etc. 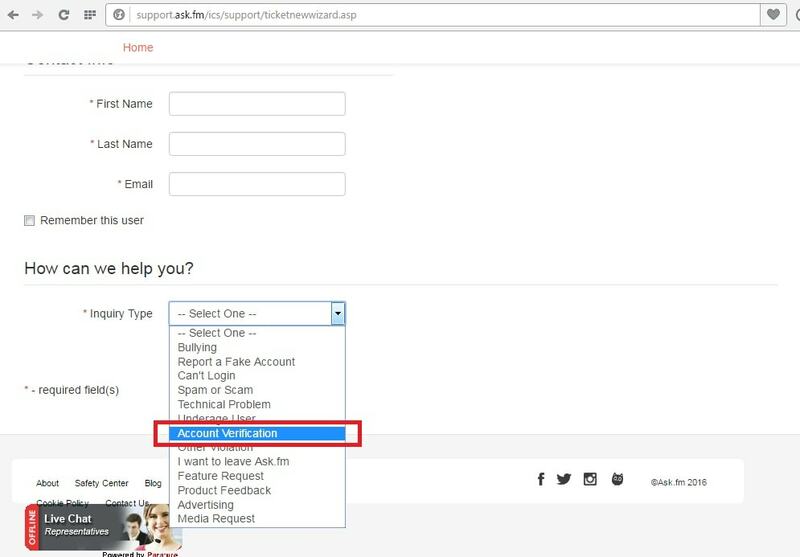 Just like the popular social networking sites mentioned before, Ask FM has released a feature which allows you to ” verify ” your account. In this article you will learn how to get verified on Ask FM. What’s the advantage of verifying your account? ​You must be blind if you see any disadvantages to this, as there are only advantages. Being verified on Ask FM means the same thing as on other social networking sites. It’s proof that the account belongs to you and also gives a celebrity type impression of your profile to the viewer. ​Now the great thing about Ask FM verification is that you don’t need to be an actual celebrity in real life, as in someone who’s featured in a blockbuster or walked the moon. You can be a ordinary person in real life and still get verified on Ask FM but that doesn’t mean there are any requirements or it’s easy or else you’d see every user verified, which would make it lose it’s standard. Good vibes: Don’t expect Ask FM to verify you if you promote hate speech or endorse bullying. Make sure to send out good vibes by answering and asking questions politely. The obvious: Make sure your account represents a real person. If your Ask FM profile has fake account written all over it, chances are Ask FM will notice and won’t accept you. To prevent this from happening, make sure to put a profile picture of yourself, connect your account to other social networking sites such as Facebook, Twitter etc. If you’re popular on AskFM it means you’re one step ahead and should go ahead on applying as you’re more likely to be accepted. If you believe you fulfill more than 3/4 requirements mentioned above, it’s time to apply. ​Note: If you’ve a verified account on Facebook or Twitter already, you can automatically verify your Ask FM account by just linking them both. 1. ​Submit a ticket by clicking here. ​3. Fill out the form. Make sure to fill out as much positive details about you as you can and include worth knowing achievements. E.g: Walked the moon, starred in a blockbuster, owner of an awesome blog like Thetic Blog etc. 4. ​Press Finish when you’re done. Now you’ve to wait. Ask FM team will review your profile and see whether you’re worthy or not to carry the ” Blue badge ” and if they do find you worthy, they’ll ask you to send a selfie to confirm that it’s you. As I said above, if you fulfill 3/4 of the requirements mentioned above, you’re less likely to get rejected. If you do get rejected, don’t cry as it doesn’t mean the end of the world and you can apply again after a month or so, meanwhile you can improve your profile to fit the requirements. How long before ill be verified if i follow this guide? Can you guide me man ? You will verified my account yeh ? And when ?! I'm not the owner of askfm, I can't verify you dude. Just follow the guide and apply for it. I have one issue when I fill out my details. . I cant see the finish button to submit ny form. . Anyone? Make sure you filled out all the boxes with *. If that doesn't work, then refresh the page.